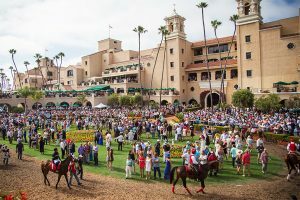 One of the best sporting event venues in California, the Iconic Del Mar Race Track, has been host to some of the most memorable Horse Races in recent history. 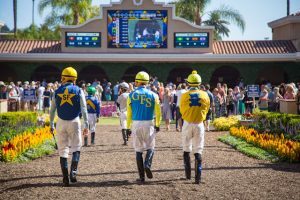 If you have never been, whether it is for Del Mar Opening Day or any of the weekly races, traffic and parking can be a major problem. We have you covered with San Diego Del Mar Race Track Limousine Bus Transportation. Book a Luxury Sedan, SUV up to 6 people, Limo or any Party Bus, Shuttle, or Charter Bus to drop you off right at the front gates. Don't pay any parking fees or hop a shuttle from 2 miles away, just worry about what horses your going to bet on to win! We offer transportation for all of San Diego County up to North County to the Del Mar Races. We guarantee you will have an amazing time with any vehicle we set you up with at The Lowest Limo Discount Rates in San Diego. Limousine rentals are widely popular during the Horse Racing Season July through September. Experience some of the best weather around, enjoy a cocktail, and gamble away with one of our San Diego Del Mar Race Track Limo Rentals. Take up to 20 friends and family to the next races at the Del Mar Race Track and take in the amazing beach scenery before and after. We have been running Charter Buses and Party Buses to The Del Mar Race Track and the San Diego County Fair for years. San Diego Limo Rental has mapped out the best packages, specials, and hourly rates based on previous experiences. Come check out San Diego Del Mar Race Track Bus Rentals up to 56 passengers in your own Party Bus, Shuttle, or Charter Bus, which will definitely get you into the gambling mood. Everyone in the group can have a great time and never have to worry about driving after. Just ask any of our amazing sales representatives for further information. We have perfected the way we price out Limo Transportation Services in San Diego. San Diego Del Mar Race Track Limousine Bus Transportation Service Pricing can easily be determined using our internal software with prices that have been intricately negotiated with multiple Limo Companies throughout San Diego. All Limousines, Sedans, and Buses are available with Point to Point Rates, One Way Transfers, Hourly Service Rates, and Hybrid Pricing.